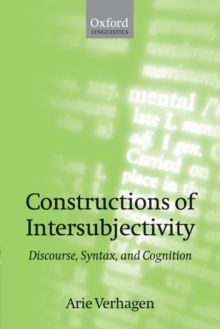 Constructions of Intersubjectivity shows that the meaning of grammatical constructions often has more to do with the human cognitive capacity for taking other peoples' points of view than with describing the world. Treating pragmatics, semantics, and syntax in parallel and integrating insights from linguistics, psychology, and studies in animal behaviour, Arie Verhagen develops a new understanding of linguistic communication. In doing so he shows thecontinuity between language and animal communication and reveals the nature of human linguistic specialization. Professor Verhagen uses Dutch and English data from a wide variety of sources and considers the contributions of grammar to the coherence of discourse. He argues that important problems in semantics and syntax may be resolved if language is understood as an instrument for exerting influence and coordinating different perspectives. The grammatical phenomena he discusses include negative expressions, the let alone construction, complementation constructions, and discourse connectives. This powerfully argued and original explanation of the nature and operation of communication will interest a wide range of scholars and advanced students in linguistics, cognitive science, and human evolution.